In my previous post I described the initial site meeting with "JLT" to discuss the parameters of the furniture designs for his office. Shortly after this meeting took place the actual renovation work began. In the photo above you can see the aluminum studs in place for the extended wall section going in. The big screen television will back onto this wall. "JLT" and I both agreed that the desk and credenza should be set into the far back corner of the space - between the windows. There is a funky piece of wall angle bridging that corner which seems to be hiding a conduit of some kind. This will be integrated into the final design so that it all but disappears from view. 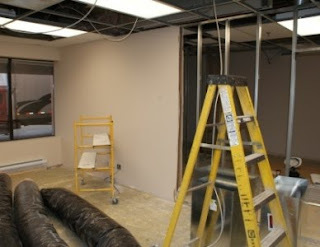 At the opposite end of the space a private washroom (with shower) is being installed. 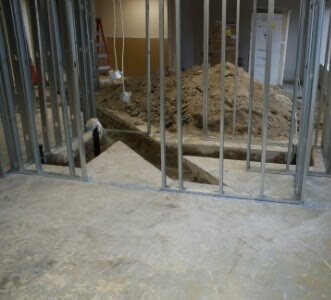 To achieve this the concrete floors had to be cut to allow for the necessary plumbing to be brought in. To the right of this photo you can see a small niche space that has been created to house a built-in cabinet for storage. In addition to general storage this cabinet will also be the "brain centre" that holds all the electronics for audio, video and lighting control systems. By this stage the overall dimension of the room were mostly determined, which made it possible to clarify the approximate size, location and shape of the desk, credenza, storage cabinet and motorized television cabinet. The inclusion of a scotch bar was not yet a certainty, since a suitable location for it had yet to be determined. As the details of the furniture designs were being clarified, "JLT" worked with his interior designer to finalize the selection of carpet and wallpaper for the office. Based on these samples we narrowed our range of wood finish options to Chestnut Ribbon Sapele, Macassar Ebony, Madagascar Rosewood, Ipe and East Indian Rosewood. Although "JLT" really liked the Chestnut Ribbon Sapele sample we showed him, I cautioned against it because of how the Chestnut stain would likely "bleed" into any inlays such as mother-of-pearl we might use. Macassar Ebony was deemed to be too dark, and the flitch sizes too small, to work successfully on large surfaces such as a desk top. Madagascar Rosewood was rejected because the colour and grain texture simply didn't work. The Ipe looked magnificent, but I was concerned about a random "splotch" that appeared in the actual test samples we made. While this discolouration may have been a natural element of the wood itself, it would end up looking ugly if it appeared unexpectedly on the top of the desk. Therefore, I decided to err on the side of caution by insisting that we not use Ipe. Of all the woods under consideration the East Indian Rosewood looked best of all. In its raw state it almost seemed too purple in colour, but once a finish was applied to the test panels a depth and richness appeared that worked perfectly with the carpet and wallpaper samples. "JLT" concurred with this assessment, so based on his approval we decided to go with this for the furniture. 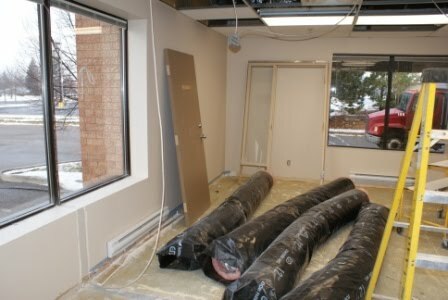 The design of the furniture was now starting to gel, and in my mind's eye I could actually see what the finished office was going to look like. We were now at the defining moment of the design of this space, and it is here that someone like "JLT" actually becomes a dream client for a studio furniture maker such as myself. Although he is always very clear on what he likes and dislikes, "JLT" does manage to curb his veto power enough so that doesn't smother the creative process. In fact, it would be appropriate to say that he actually participates in the creative process enough so that collectively the ideas end up manifesting in a manner that is not only effortless but almost intuitive in some cases. Although this last part is difficult to articulate, hopefully I can illustrate it better in the next post. That post will evaluate the resulting furniture designs and office layout from the standpoint of Feng shui , which is an ancient Chinese system of aesthetic that is growing in popularity in North America and around the world. Feng shui is ultimately about flow and balance, and I was pleasantly surprised at how well the final design of the office melded almost perfectly with those principles - especially since very little conscious effort was made to do so. 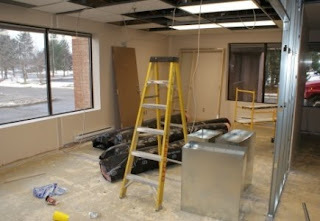 Next: The Executive Office - (Part 4) - Applying Feng shui to the Design.